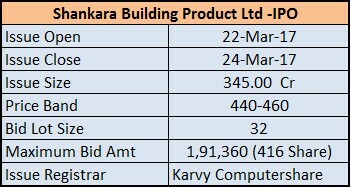 IPO of Shankara Building Product Ltd opens from 22 Mar. 2017 to 24 Mar. 2017. The price band of Issue is Rs. 440 to Rs. 460. The fresh issue has an offer for sale of 65,21,740 shares (Rs. 345.00 Cr. -upper band). 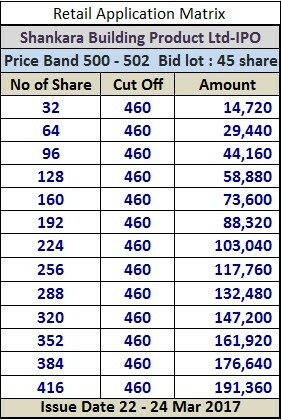 The minimum application size and bid lot 32 Equity Shares and in multiples of 32 Equity Shares thereof. Shankara Building Products Ltd is a leading organized retailers of home improvement and building products in India based on number stores, operating under the trade name “Shankara BuildPro”. Under retail operations, Shankara offer a comprehensive range of products at stores, including structural steel, cement, TMT bars, hollow blocks, pipes and tubes, roofing solutions, welding accessories, primer, solar heaters, plumbing, tiles, plywood, kitchen Sinks and other allied products. General Corporate purposes and issue expenses attributed to Shankara.